It’s an all Philadelphia Amp final as two teammates from the mixed national runners up face off for the title of 2017 Block of the Year. Which do you think was more impressive? The final round of voting will run through Thursday, February 15th, at 5 PM Eastern. Chris Bartoli’s long nightmare continues as he continues to helplessly flail at a disc that Mike Ing straight up stole from him. He’s not the first opponent Ing has brutally blown up on an in-cut and he certainly won’t be the last—we can only hope that future highlights from the Pittsburgh star are caught as beautifully on film as this example. He emerges from one side of the bracket as the best male block of the year, but now squares off against an Amp teammate whose nominated block came at the biggest moment of the club season. Good luck. Amp’s Club POTY runner up finally proved Manuela Cardenas to be mortal, dealing her a first ever defeat in a Block of the Year bracket1 after being voted the winner in seven consecutive rounds. Now, Thompson’s incredible double-game point block from the national title game is one victory away from making it two straight female winners in our Block of the Year competition. With Ing and Thompson garnering almost exactly the same number of votes in the semifinal round, the final could be her most competitive matchup yet. 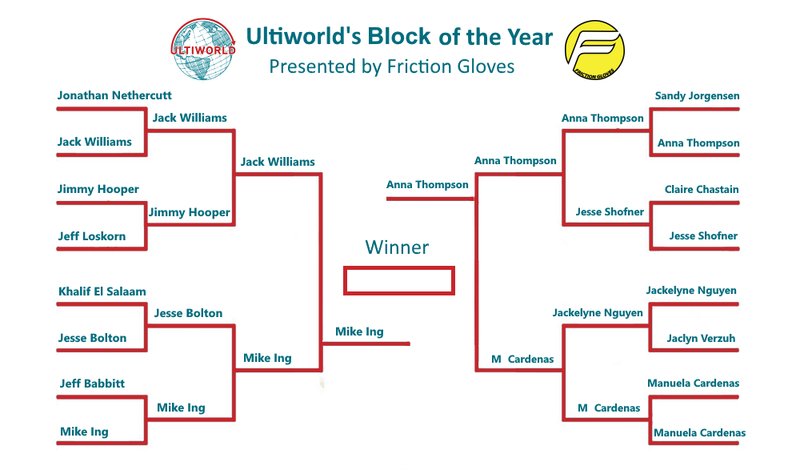 Comments on "Ultiworld’s 2017 Block Of The Year Bracket: Final, Presented By Friction Gloves"